Hello everybody, this is my first review on this forum. I am a hobbyist woodworker, just working on small projects late at night or during weekends and learning on the way for the past 2-3 years. I started just with a bunch of hand tools and gradually evolved to buy a few indispensable tools. 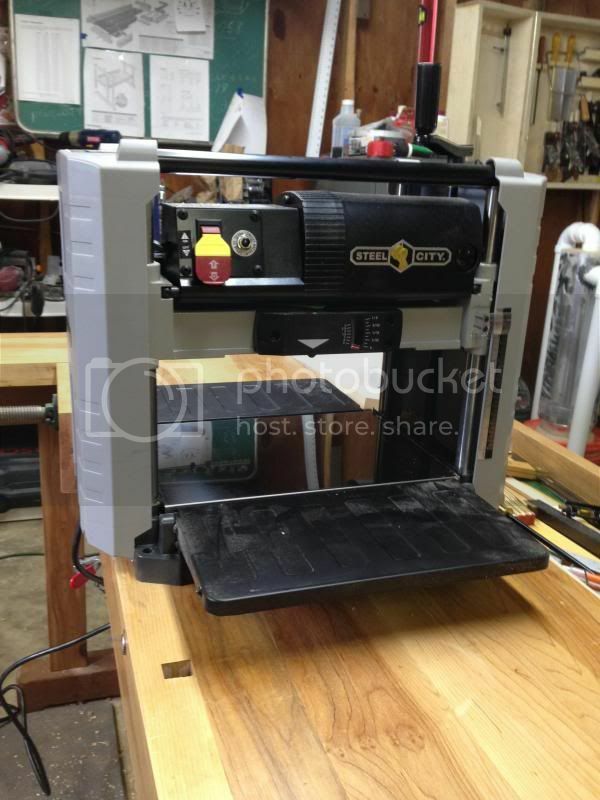 I bought this planer from Amazon, total price including shipping at my door in 2 days $299. As seen below it arrived in a sturdy box, no dents or scratches. After removing some styrofoam and protective bag, following very clear instructions on the supplied manual the planer was ready. I probably spent 5-10 minutes adjusting the height of the indeed and outfeed tables. An allen wrench for general adjustments as well as some sort of device an another wrench to change the blades are included. 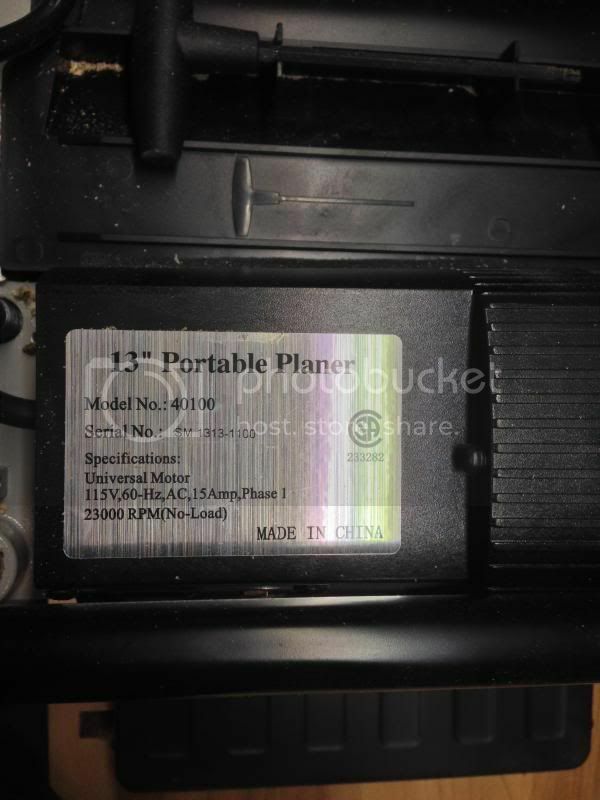 The universal motor is made in China as well as the planer itself. Here some specifications. 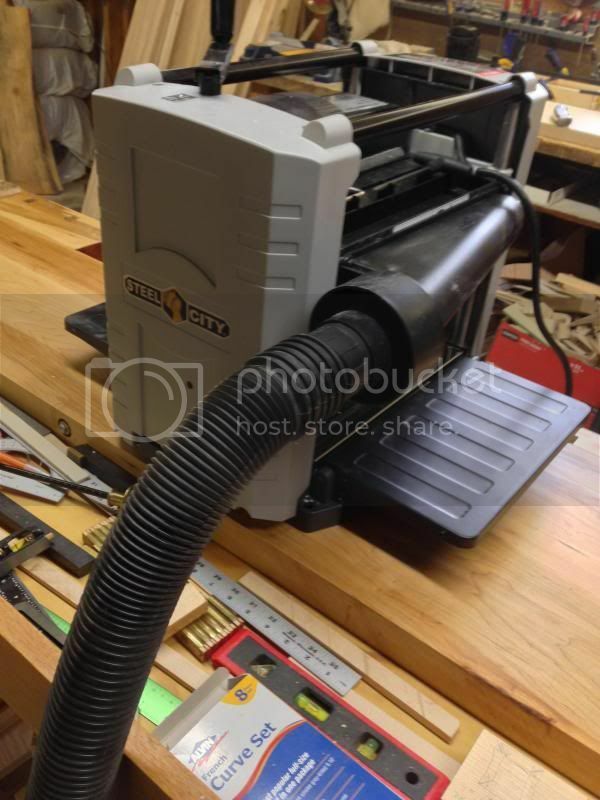 One of the features that steer me into this planer was the dust collection included. It works quite well and installation is straight forward. I have not tried other planers to compare but this one seems fairly quiet, of course I always wear ear protection in my shop but I would compare to the noise of my Bosch router. So far I have planned several feet of yellow pine, cherry, ash, oak and hard maple, nothing bigger than 6 feet long or thicker than 8/4. Very smooth surfaces are achieved in any of the prior mentioned woods. The dust collector was very efficient, about 90% of the shavings were collected and a guesstimate of 10% piles up as seen below. Compared to other different brand planers I have seen in Home Depot, Lowe’s or Woodcraft stores I would dare to say this is pretty similar as far as motor specs, it only has 2 blades but result is quite smooth, it lacks preset thickness gauge and after using it a while I can see where having the height adjustment on the side instead of the top would be convenient. The small gauge that comes in the front is very handy to remind yourself about not removing much wood in one pass which leads me to the next point, so far no snipe has been noticed with most woods. I only had a bit of snipe with the hard maple 6 foot long pieces I planned but very likely due to the fact the infeed/outfeed tables are very narrow when compare to other brands in the market. Nonetheless no big deal since a couple of rollers or extra table beds can be built easily to fit. By the way I have been running it on top of my workbench as seen on the pictures and no vibration issues or displacement noticed. 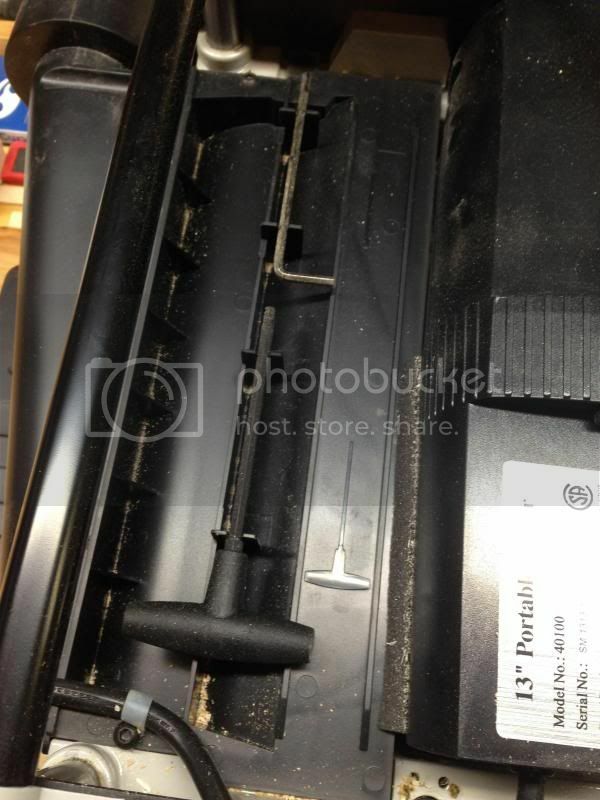 I will update this post in a few months or weeks depending on when I need to replace the blades. I have not bought a pair yet but I believe they run about $40 per pack from the manufacturer. Somewhere I read Delta planer blades might fit ? Not sure about this though. Any comments or tips on this tool would be greatly appreciatted since I have not found many reviews online about this tool yet. I have it’s cousin, the General International and it is one nice little planer. I have the same planner with the Helical head, but still getting a little snipe at the start of the board. Feed tables are very flimsy so made a table extension out of some melamine to extend the infeed and outfeed tables and it helped a lot. 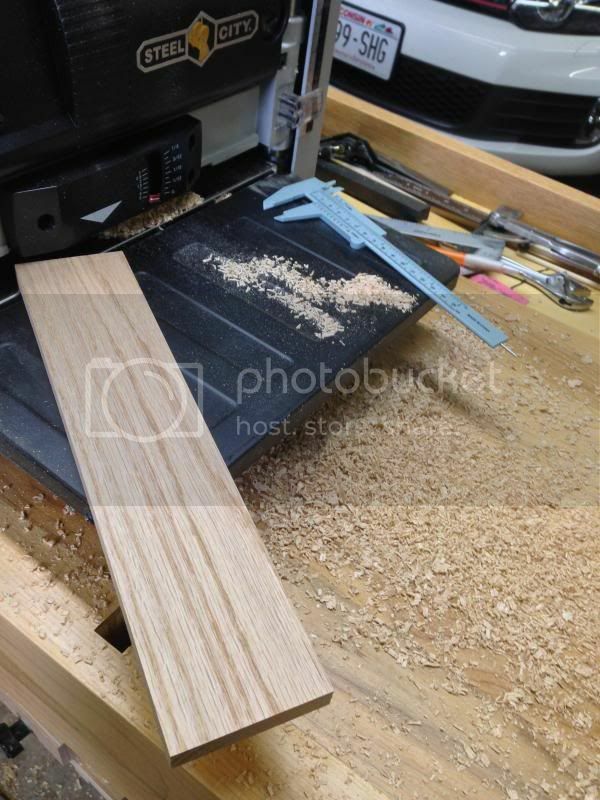 Intend to make a torsion box tray some day when I can find some free time. Very similar to my AP1300. These little planers can give you a lot of beautiful wood to work with. When I have a more permanent place for mine to live, I’m going to make the extended bed to help control what very little snipe I have seen. The Ridgid I have is almost the same. I read somewhere (here?) that you can reduce snip by angling the outfeed and infeed table just slightly up. It worked wonders for mine. I have the same planer. I was pleased with it until last weekend when it started sniping terribly (1/8” or more) last weekend. I was so angry at the trashed piece of hard maple I haven’t gone back to figure out what went wrong. I’ll try to go through it and resolve the issue this weekend (with cheaper lumber) when cooler heads prevail! Hard maple can be difficult on lunchbox planers. Two tips: 1) skew the wood as much as possible; 2) dampen the wood with a swipe of a damp rag before sending it through. Can work wonders with hard or curly maple. Great planer! Thanks for the review. 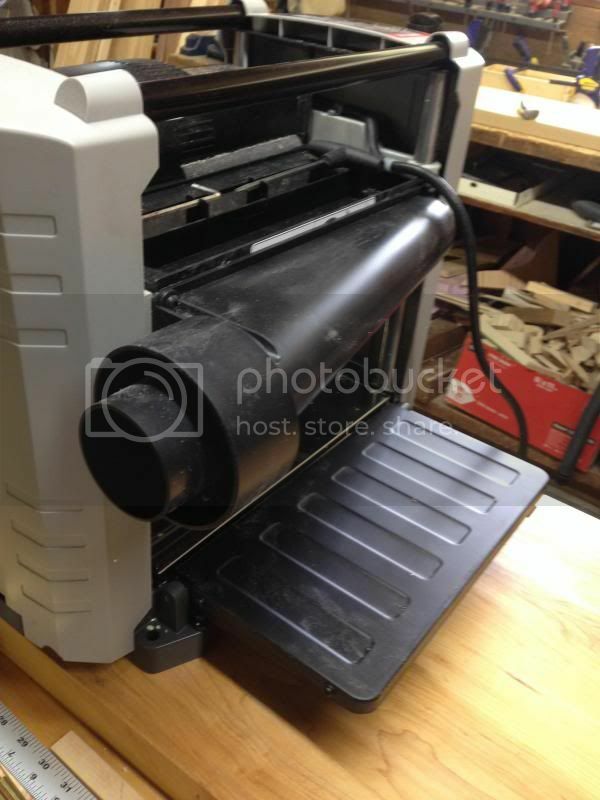 This planer has been on my radar. Thanks for the review, looking forward to updates along the way. 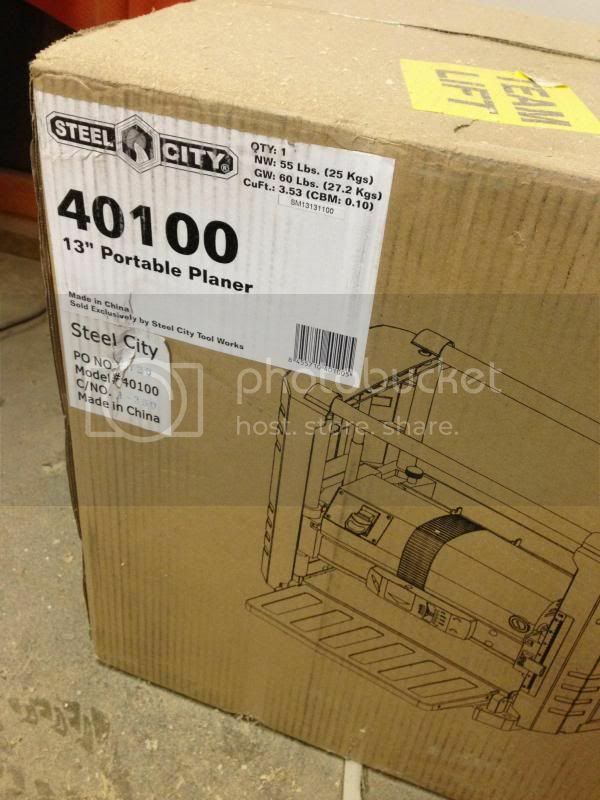 In case you are looking for the planer, and since Steel City is no longer, I have found that the factory that made their portable planers is now selling direct under their own Cutech Tool label.